299 Beacon is located on the SW corner of Beacon and Exeter, with 295-297 Beacon to the east, across Exeter, 301 Beacon to the west, 282 Beacon to the north, across Beacon, and 1 Exeter to the south. 299 Beacon was built ca. 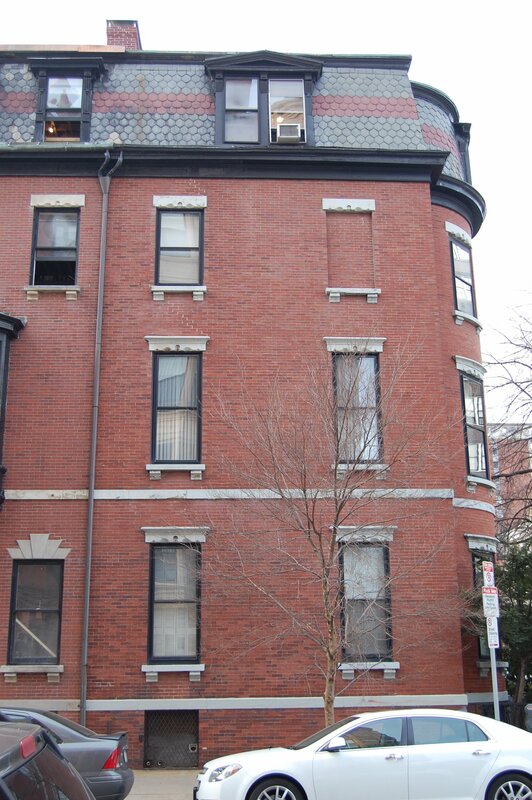 1870 for building contractor George Wheatland, Jr., for speculative sale, one of four contiguous houses (299 Beacon and 1-3-5 Exeter) which form a single unit between Beacon Street and Public Alley 417. George Wheatland, Jr., purchased the land for 299 Beacon and 1-3-5 Exeter on February 2, 1870, from the Commonwealth of Massachusetts. The original parcel had an 80 foot frontage on Beacon. He built the four houses on the eastern 61 feet of the parcel, with 299 Beacon about 40 feet wide and 1-3-5 Exeter about 40 feet deep, leaving an open yard area of about 21 feet to the west. When he sold the houses, he included a permanent easement across the rear of 1-3-5 Exeter to provide for passage and drainage to the alley. Click here for an index to the deeds for 299 Beacon. On March 1, 1871, 299 Beacon was purchased from George Wheatland, Jr., by George Washington Simmons. On the same day, he also purchased the remainder of George Wheatland’s parcel, a 19 foot wide vacant lot to the west (where 301 Beacon later would be built). George W. Simmons also purchased 1 Exeter from George Wheatland in December of 1870; it became the home of his son-in-law and daughter, Edward Henshaw and Frances A. (Simmons) Henshaw. George W, Simmons was a retail clothing merchant. In 1876, he was a leader in the citizens’ movement to save Old South Meetinghouse from being demolished. He and his wife, Frances A. (Gay) Simmons, lived at 6 Walnut. On May 29, 1872, 299 Beacon was purchased from George W. Simmons by Henry Elmer Townsend. He and his wife, Emilie Wilhelmine (Kaupe) Townsend, lived at 45 Commonwealth with his mother, Wealthy Ann (Beecher) Townsend, the widow of Elmer Townsend. They continued to live there until about 1874, when they moved to 299 Beacon. A physician by training, Henry Townsend was president of the Shoe Machinery Manufacturing Company and later became an investor in patents. When he sold 299 Beacon to Henry Townsend, George W. Simmons retained the lot to the west (where 301 Beacon later would be built) and he included in the deed with Henry Townsend language requiring that the yard area to the west of the house (between 299 Beacon and 301 Beacon) remain vacant for thirty years. 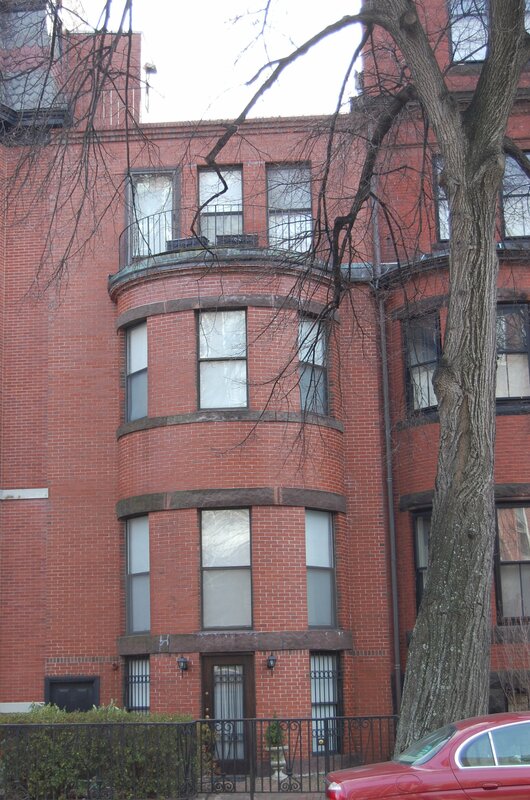 The Townsends continued to live at 299 Beacon in 1875, but had moved to Jamaica Plain by 1876. On November 5, 1875, Henry Townsend sold 299 Beacon back to George W. Simmons. He and his wife continued to live at 6 Walnut. By the 1876-1877 winter season, 299 Beacon was the home of Robert S. Covell, president of the National Eagle Bank, and his wife, Caroline W. (Hammond) Covell. They previously had lived at the Hotel Pelham. 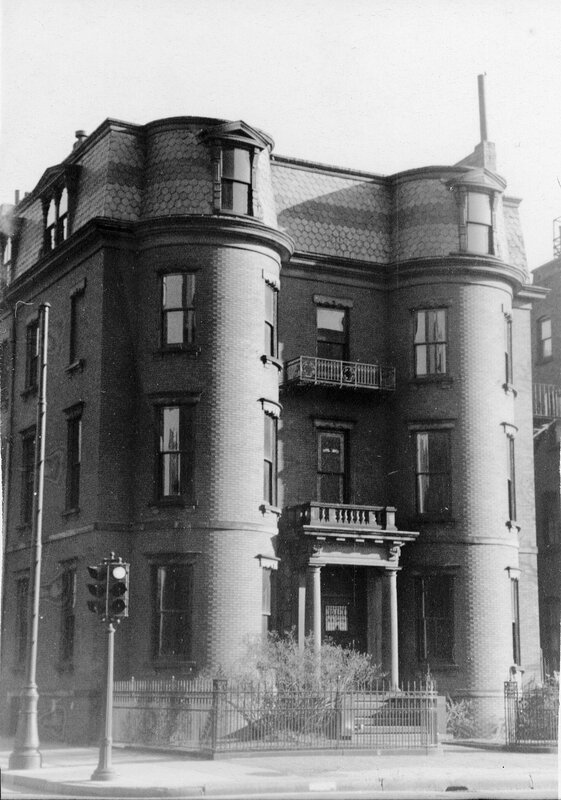 They continued to live at 299 Beacon during the 1880-1881 winter season, but moved thereafter to the Hotel Brunswick (southeast corner of Clarendon and Boylston). 299 Beacon was not listed in the 1882 Blue Book. By the 1882-1883 winter season, George and Frances (Gay) Simmons had moved from 6 Walnut and had made 299 Beacon their home. George Simmons died in December of 1882. In June of 1883, his heirs sold the lot at 301 Beacon to George F. Niles. As part of the transaction, they removed the restriction preventing the construction of any building on the yard area between 299 Beacon and 301 Beacon. Frances Simmons continued to live at 299 Beacon until her death in July of 1885. 299 Beacon was not listed in the 1886 and 1887 Blue Books. By the 1887-1888 winter season, 299 Beacon was the home of Sarah Bryant (Dennie) Boardman, the widow of leather merchant Benjamin Greenleaf Boardman, Jr. He had died in February of 1887; prior to his death, they had lived at 120 Beacon. Sarah Boardman died in October of 1888. After her death, 299 Beacon became the home of her unmarried daughter, Eliza Dennie Boardman. She subsequently acquired the property from George Simmons’s heirs through several transactions between June of 1891 and January of 1892. For the next four winter seasons, Miss Boardman was living elsewhere. During the 1891-1892 and 1892-1893 seasons, she was living at the Hotel Vendome, and during the other seasons she probably was traveling. During the 1890-1891 and 1891-1892 winter season, 299 Beacon was the home of banker Louis Curtis and his wife, Fanny Leland (Richardson) Curtis. They had married in October of 1890 and 299 Beacon probably was their first home together. Before their marriage, Louis Curtis had lived at 179 Marlborough with his brother and sister-in-law, Horatio and Annie (Winthrop) Curtis, and his twin brother, Laurence Curtis. By the 1892-1893 winter season, Louis and Fanny Curtis had moved to a new home they had built at 464 Beacon. 299 Beacon was not listed in the 1893 Blue Book. During the 1893-1894 winter season, it was the home of Charles Henry Hayden, a wallpaper merchant. He was unmarried. He previously had lived at 12 East Brookline. By 1895, he had moved to 144 Marlborough. By the 1894-1895 winter season, 299 Beacon was once again Eliza Boardman’s home. She continued to live there during the next season, but then moved to The Marlborough at 416 Marlborough. By the 1896-1897 winter season, 299 Beacon was the home of Dr. Frederick Melancthon Briggs, a physician and surgeon, and his wife, Grace Stickney (Wood) Briggs. They previously had lived in an apartment at 222 Marlborough. 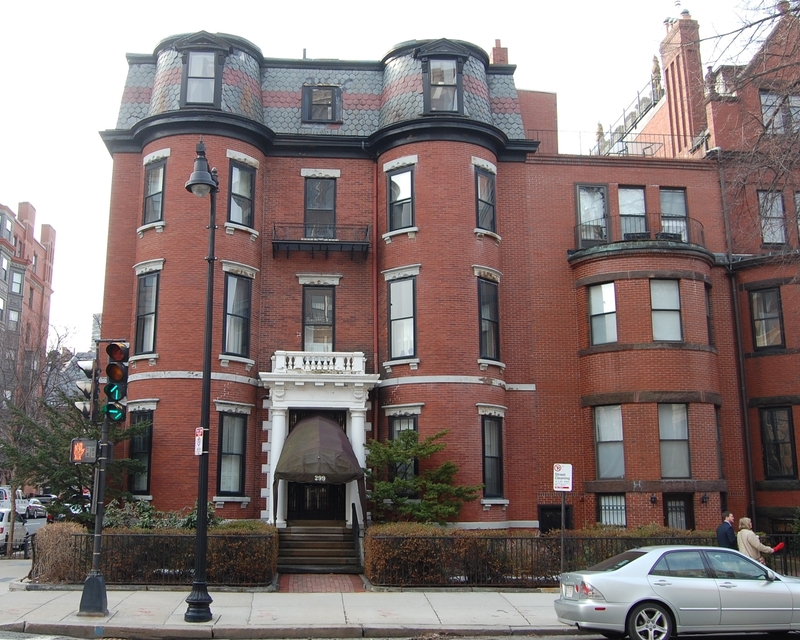 They continued to live at 299 Beacon in 1899, but had moved to The Stratford apartments at 31 Massachusetts Avenue by the time of the 1900 US Census. By 1900, 299 Beacon was the home of John Butler Smith and his wife, Emma Elizabeth (Lavender) Smith. Living with them was Emma Smith’s unmarried sister, Frances L. Lavender. The Smiths initially leased the house from Eliza Boardman, but then purchased it from her on March 12, 1902. John Butler Smith was owner of the Contoocook Mills in New Hampshire, manufacturers of woolen underwear. He had served as Governor of New Hampshire in 1892. He died in August of 1914. Emma Smith continued to live at 299 Marlborough until her death in April of 1925. 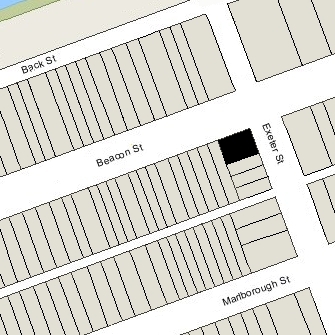 After Emma Smith’s death, Frances Lavender moved to The Westminster (southeast corner of St. James and Trinity Place). 299 Beacon was inherited by John and Emma Smith’s surviving son, Norman Butler Smith. He was a real estate dealer with offices at 283 Dartmouth, He and his wife, Dorothy H. (Warren) Smith, lived in Brookline. He leased 299 Beacon to others. By the 1925-1926 winter season, 299 Beacon was the home of William Howard Kirkbride and his wife, Georgiana Sheldon (Tilney) Kirkbride. They previously had lived at 11 Lime. They also maintained a home in Dublin, New Hampshire..
William Kirkbride was president of the Pacific Coast Construction Company and an author and playwright. By 1928, they had moved to an apartment at 192 Commonwealth. 299 Beacon was not listed in the 1928 Blue Book. During the 1928-1929 and 1929-1930 winter seasons, 299 Beacon was the home of shoe manufacturer Charles B. Field and his wife, Anne Lamont (Dugan) Field. They previously had lived in Brookline. They also maintained a home in Marblehead. They moved to New York City in 1930. 299 Beacon was not listed in the 1931-1933 Blue Books and was shown as vacant in the 1930-1933 City Directories. In 1933, 299 Beacon was leased by the Malkin Conservatory of Music for use as a music school. The school was founded by Joseph Malkin, principal cellist with the Boston Symphony Orchestra, and his brothers. He directed the Conservatory for ten years and then joined the New York Philharmonic. The teaching staff of Malkin Conservatory included composer Arnold Schoenberg, who taught briefly at the Conservatory in 1933-1934 after fleeing Europe, and composer Ernst Krenek. The Conservatory continued to be located at 299 Beacon until about 1941, when it moved briefly to 267 Commonwealth. 299 Beacon was shown as vacant in the 1942 and 1943 City Directories. By 1944, Norman and Dorothy (Warren) Smith, had made 299 Beacon their home and his real estate office. They continued to live there until about 1948. On June 15, 1948, 299 Beacon was acquired from Norman B. Smith by real estate dealer Thomas J. Diab. By 1949, 299 Beacon was the fraternity house of the Phi Sigma Kappa fraternity of Boston University. It continued to be located there in 1950, but moved in that year to 330 Beacon. 299 Beacon was shown as vacant in the 1951 Boston City Directory. In February of 1951, Thomas Diab applied for (and subsequently received) permission to convert the property into six apartments. On October 15, 1951, he transferred the property to his real estate company, Baid Realty Corp. (Baid being Diab spelled backwards). The property changed hands and on September 1, 1977, was purchased by Daniel F. Marr, trustee of the Judith Realty Trust II. In May of 1984, the Judith Realty Trust II applied for (and subsequently received) permission to construct a four-story addition in the open area to the west of the building, between 299 and 301 Beacon. The expanded property remained six units. On September 5, 2002, Nancy Castro-Reich, successor trustee and sole beneficiary of the Judith Realty Trust II, transferred 299 Beacon into her own name. 299 Beacon remained an apartment building, assessed as a four- to six-family dwelling, in 2016.